When we talk about salmon brochettes we mean a very nutritious food and it has earned its reputation as one of the healthiest in the world. Salmon is rich in protein and essential fatty acids for health. It is also an excellent source of vitamins such as B12 and B6 and niacin, in addition to minerals such as selenium, magnesium and significant amounts of calcium. Today we will learn more about the properties of salmon for health. In general, regular consumption of salmon rewards benefits at the level of the heart and circulatory system thanks to its omega-3 content, repairing tissues and lowering blood pressure figures, and helps prevent the famous strokes (strokes) . Once frozen for 48 hours and thawed the salmon loin in the refrigerator, cut into strips of about two centimeters and are in dice. Place the pieces of salmon in a bowl and season with the lemon juice, lime juice and the orange juice. Add a pinch of salt and another freshly ground pepper. We let it macerate for a couple of hours in the fridge. We remove, insert two or three pieces of salmon on skewers and place in a presentation dish. Add the extra virgin olive oil in the juice of the maceration, along with half a teaspoon of soy sauce, and emulsify beating with a fork. We tried, we rectified the point of acidity with a pinch of sugar if needed. Garnish the skewers of marinated salmon and scrape over grated orange and lime. These salmon skewers are delicious and we can value them with 4.5 points as they stand out from the more than 220 recipes we have of this type, we hope you like them. 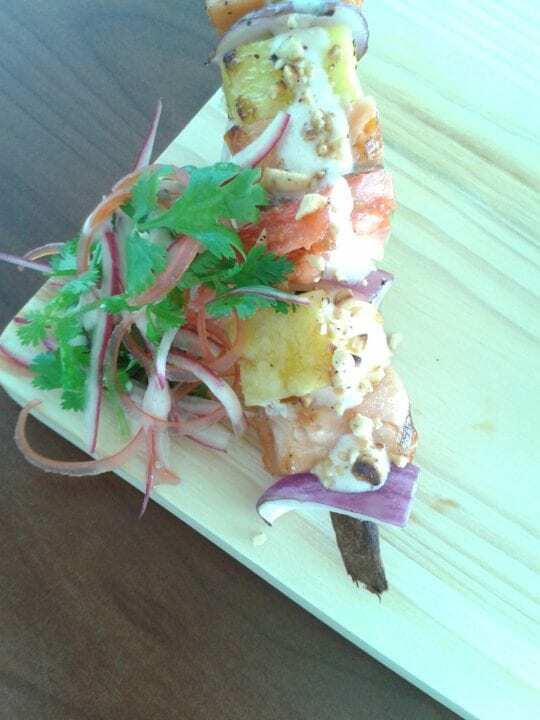 And now its time to enjoy your yummy salmon brochettes.